Whether you are are thinking about joining GSTA or you are a long-time member, it's important to know the value of being a GSTA member. If you want to connect with colleagues across the state, stay up to date on the latest professional and policy information, have a voice in state policy, and connect to science education resources online and in your community, then a GSTA membership is the best professional investment you can make. Join more than 2,000 K-12 science teachers, pre-service teachers, higher education faculty, and education leaders who are already GSTA members. Help us speak up for science education in Georgia, and we'll help you bring excellent science education to the students in your classroom. Remember that GSTA is YOUR professional organization and we are here FOR YOU! Want more specifics? GSTA membership offers the following benefits. Network with colleagues all over the state online and in person. Stay current on the latest professional information, opportunities, and policy changes. Access professional resources that will help you improve your practice and your students' learning. 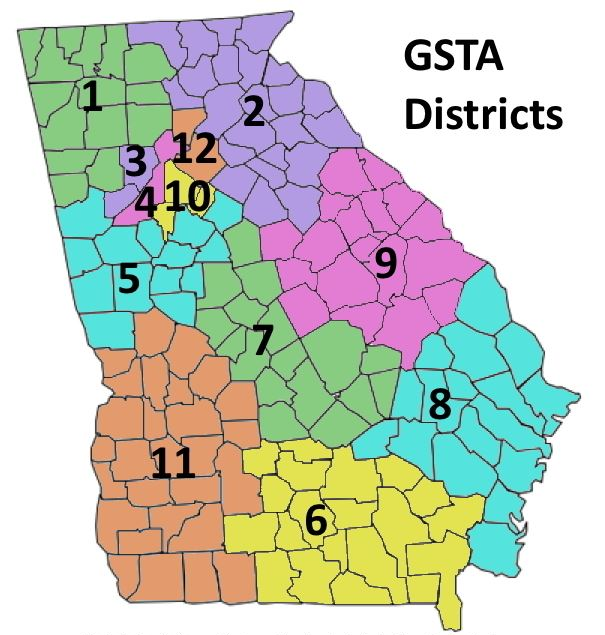 Contribute to and benefit from GSTA's efforts to advocate for excellent science education for all students in Georgia. Learning, for you and your students, doesn't happen only in the classroom. That's why GSTA partners with informal science education organizations and helps connect you to local resources. Before starting your membership application, find your district using the map at the right. If you need a list of counties in each district, then you can find that on the Find Your Representative page. Be sure to apply based on the county in which you work, if it is different than where you live. Pre-service teachers can register for a one year membership at a reduced cost. A .edu email address must be provided or the membership is subject to cancellation without refund. Why isn't there a member discount for GSTA's annual state conference? Conference registration actually includes a complimentary one-year GSTA membership. This approach is more compatible with school district financial guidelines. Does my GSTA membership include membership to NSTA? No. GSTA is a chapter of the National Science Teachers Association (NSTA), but the two organizations maintain separate memberships. You can visit the NSTA site to learn about NSTA membership. Who can I contact with other membership questions? GSTA's Vice President serves as our Membership Chair and can answer any other questions you might have. Click here to email the current Vice President.